Throckmorton P. Gildersleeve was a popular character, appearing each week on the Fibber McGee & Molly radio show. 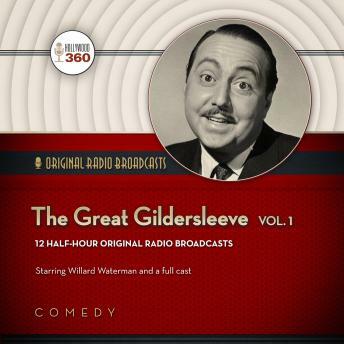 On August 31, 1941, Gildersleeve landed his own situation comedy show, The Great Gildersleeve, which was radio’s first spin-off. Gildersleeve moved from the town of Wistful Vista to Summerfield, where he oversaw his late brother-in-law’s estate and took on the rearing of his orphaned niece and nephew, Marjorie (originally played by Lurene Tuttle and followed by Louise Erickson and Mary Lee Robb) and Leroy Forester (Walter Tetley). The household also included a cook named Birdie. The Great Gildersleeve was the first show to be centered on a single parent balancing raising children, work, and a social life, accomplished with taste and genuine wit, often at the expense of Gildersleeve’s slightly understated pomposity. Radio veteran Hal Peary originated the role of Gildersleeve but left the series at the height of its popularity in 1950, giving way to well-known character actor Willard Waterman. Waterman continued in the radio role until 1957 and also played Gildersleeve in a television version syndicated in 1955.